The 2010 Social Policy Association Awards Ceremony was held during the Association’s Annual Conference, at the University of Lincoln 5-7th July 2010. The awards, sponsored by Cambridge University Press and The Policy Press, were presented by the SPA President, the Financial Times journalist Nick Timmins. 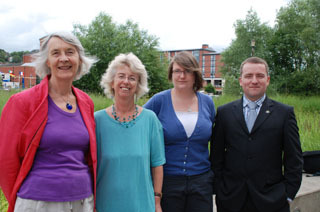 The 2010 winners were (from left to right on photo): Professors Jan Pahl (Univ of Kent) and Ruth Lister (Univ of Loughborough) won the Lifetime Achievement Award; Helen Dickinson (Univ of Birmingham) won the Best Newcomer; and Karl Wilding from NCVO won Outstanding Contribution from a Non-Academic. Awarded to Karl Wilding and the Research Team at the National Council for Voluntary Organisations.